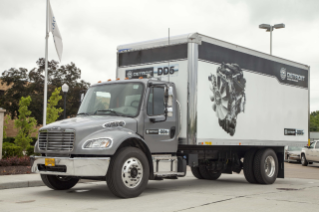 YOUNTVILLE, Calif. – July 28, 2016 – Daimler Trucks North America announced today that it will begin production of Freightliner® M2106 trucks equipped with the DD5™ engine beginning in October. The DD5 is the newest Detroit engine to be released and is built off of the same sound principles and design that have led to overwhelming success of its heavy duty platform which includes the DD13®, DD15® and DD16®. The DD5 will offer customers a number of benefits over competitive engines. One example is the DD5 best in class scheduled maintenance intervals. Operators in short-haul pick-up and delivery applications will have extended oil and fuel filter change intervals up to 45,000 miles. The engine has undergone extensive development and testing in preparation for release and boasts impressive durability with an expected B10 life of 400,000 miles. The engine will first be offered in 210 HP0-575 lb-ft and 230 HP-660 lb-ft ratings and testing has proven that the DD5 will provide best in class fuel efficiency. In addition, Detroit will provide DD5 customers its award winning Detroit Connect Virtual Technician™ remote diagnostics system. The same system heavy duty customers use to make service decisions that minimize downtime, support accurate repairs when necessary and maximize up time. The DD5 5.1L engine uses common design principles found on the heavy duty platform such as a deep rib block that provides robustness and minimizes noise. The engine also introduces some leading edge technologies of its own such as variable cam phasing. Variable cam phasing technology provides Detroit the ability to optimize thermal management under low engine load conditions and improve the overall performance of the aftertreatment system. This is a key benefit to keeping customers up and running trouble free in the pick-up and delivery segment that often experience low load stop and go operating conditions. While pick-up and delivery is a perfect segment for the initial launch of the DD5, the engine is also a great fit for a number of vocational applications. There are already plans to include power take-off options and widen its use within the DTNA portfolio in 2018 as production of the DD5 shifts from Mannheim, Germany to its Detroit powertrain facility. Detroit also has plans to launch a larger displacement DD8™ beginning in 2018. Detroit is pleased to announce the receipt of EPA certification for the new DD5 medium duty engine. Detroit designed the engine to meet 2017 greenhouse gas and fuel efficiency standards as well as all on-board diagnostic and near-zero criteria pollutant standards. By meeting the world’s most stringent fuel efficiency standards for such engines, Detroit demonstrates our commitment to delivering customers optimal Real Cost of Ownership℠. Detroit offers a complete line of heavy-duty diesel engines, axles, transmissions, safety systems and connected vehicle services for the commercial transportation industry in both the on-highway and vocational markets. Detroit products are sold and serviced through a network of hundreds of locations throughout North America. For more information, or to locate the nearest Detroit location, visit www.DemandDetroit.com. Detroit is a brand of Detroit Diesel Corporation, a subsidiary of Daimler Trucks North America. Daimler Trucks North America LLC, headquartered in Portland, Oregon, is the leading heavy-duty truck manufacturer in North America. Daimler Trucks North America produces and markets commercial vehicles under the Freightliner, Western Star and Thomas Built Buses nameplates. Daimler Trucks North America is a Daimler company, the world's leading commercial vehicle manufacturer.